FN66139 - Steampunk Brown Goggles with Gold Rims. Steampunk Brown Goggles with Gold Rims. Designed for Neo-Victorian Industrial fashion and a Steampunk persona, these Brown Goggles are great for the Motorcycle Bandit, Sky Pirate or Adventurer living in a steam powered world. Our Steampunk Brown Goggles feature a brown plastic base, gold rims, clear lenses, nose strap and elastic head strap. There are a variety of characters our Steampunk Brown Goggles can bring to life in your Steampunk costume. 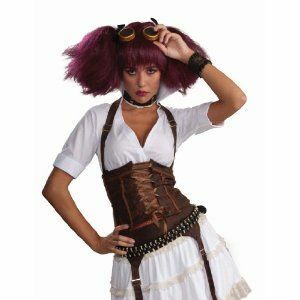 It will bring an eccentric look to any Steampunk inventor or engineer costume, too! One size fits most adults and older teens. Designed for Neo-Victorian Industrial fashion and a Steampunk persona Costume Suggestions: Great for the Motorcycle Bandit, Sky Pirate, Victorian Inventor, Steampunk Inventor or Adventurer living in a steam powered world It will bring an eccentric look to any Steampunk inventor or engineer costume, too! Great for any Steampunk Costumes, 20's Roadster costumes. Great for Steampunk Costume or Burning Man.